Once upon a time I visited a magical, snow-covered forest. It is the sort of forest one imagines in fairy tales and that could easily be mistaken for the Lantern Wood that features in the Chronicles of Narnia. In fact the forest is in eastern Poland. Its name is Białowieża. I am a forest fan, so when an Anglo-Polish friend organised a tailored trip to Białowieża I leapt at the opportunity to join her. Before the arrival of humans in Europe, a vast primeval forest covered the European Plain all the way from the west coast of France to Russia in the east. As people began settling the continent thousands of years ago, they gradually cut down most of the trees to make way for farmland. Straddling the border with Belarus, the Białowieża forest is the largest remaining section of the original forest and the only part that is still in its primeval state. The Forêt de Soignes outside my home town of Brussels is also a fragment of the same ancient forest. Białowieża forest is a UNESCO World Heritage Site. Covering 1420 square kilometres, the forest’s old growth woodland represents an irreplaceable pool of biodiversity. UNESCO describes it as a place of “outstanding universal value”. It includes large areas where there is no human interference, such as forestry management. Instead, nature takes its course. The resulting forestscape is quite distinctive and very different from that of the highly managed Forêt de Soignes. Whereas in my local forest dead or dying trees are usually felled and cut up for timber, in Białowieża Forest they are left to rot. Many trees that fall do not even reach the ground, instead crashing into others, their trunks remaining as huge diagonal silhouettes. This gives the forest a strange, almost other worldly aspect. The most protected core of the forest can only be visited in the company of an approved guide and visitor numbers are limited. The dense forest is a haven for a wealth of species, large and small. As trees die or fall, the dead wood provides a habitat and food for fungi and invertebrates. Over 12,000 species of invertebrates – such as worms, beetles and butterflies – wriggle, crawl or fly through the forest. There are also more than 250 types of birds, 13 species of amphibians and 7 of reptiles. The rich woodland is also home to 59 species of mammals, including wolves, lynxes and otters. The stars of the forest’s fauna, though, are its bison. Białowieża has the largest free-roaming population of European Bison – about 900 of them, a quarter of the total number. With adult males weighing up to 1000 kilos, these creatures are the heaviest land animal in Europe. In the early 20th century the European bison was hunted to extinction in the wild, the last one in Białowieża forest being shot in 1921. Today’s population was reintroduced using animals bred from the 50 that remained in zoos. Although their numbers have grown, the bison are still classed as an endangered species. Bison live in small herds of about a dozen individuals. During the day they usually stay in the forest, but at night the often come out to clearings or fields at the forest’s edge. My friend had arranged an early morning bison safari to try to find some before they returned to the shelter of the forest. It was midwinter and thick snow lay everywhere, making it easier to spot any bison that might be lurking. We were lucky and managed to see several specimens of this iconic species – from a safe distance. 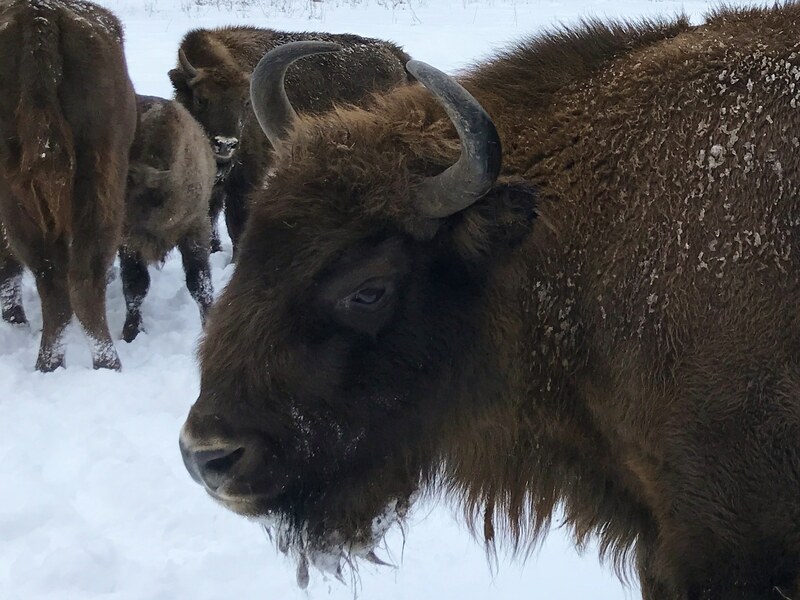 If Białowieża’s bison are well protected, the same cannot be said of the forest itself. Recently, the Polish government came under international criticism for allowing a huge increase in logging in the forest. The logging was supposedly to stop the spread of an outbreak of spruce bark beetle, but scientists dismissed the government’s claims. Opponents of the logging said it was just a money-making scheme for the politicians’ friends. Environmentalists took the case to the European Court of Justice, the European Union’s highest court. The court judged the logging illegal and ordered the Polish government to stop. Nevertheless, it is estimated that between 10,000 and 100,000 trees had already been felled. Poland’s government has said it will respect the judgement. I hope so because this special forest is part of all our heritage.